A southern California native, Richard Bunck has watched Apple Valley grow from a rural and commuter town deeply rooted in its agricultural history to a community which has uniquely been able to stay true to its roots while developing into a thriving, dynamic and diverse city that provides a family-friendly environment by having good schools, maintained parks, and safe streets. Richard’s commitment to the town of Apple Valley stems from his experience as a longtime small business owner in the community. He has worked in countless homes and small businesses in Apple Valley as a professional electric engineer. His heroes in public life are John F. Kennedy, Ronald Reagan, and Howard Jarvis, the father of prop 13. Howard Jarvis saved many homeowners in California from losing their homes to excessive property taxes. 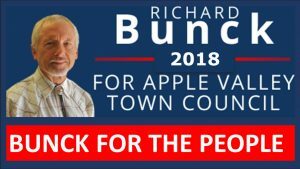 A legacy of fighting outrageous taxes and making public servants accountable to the people is what inspired Richard Bunck to stand for Apple Valley Town Council. He is a man of deep Christian faith and a member of a local church. He has donated and volunteered in numerous faith-based initiatives to help those in need – particularly around the holidays.